LTA collaborated with SG Enable to adopt Red Hill station and improving the daily walking route between the station and the nearby Enabling Village for persons with disabilities. This includes bright lane markings and rest stops are built to provide brief respite for those with mobility issues. The yellow markings by the sides of the pathway serve as guidelines to aid pedestrians with low vision. Working with various voluntary welfare organisations, caregivers and people with disabilities, LTA is trying to understand, design and develop the improvements needed. The Pathlight School’s Art Faculty also contributed to design vibrant signings to direct users to the Enabling Village – a community space for training and employing people with disabilities. These enhancements follow the transport ministry’s announcement during a Committee of Supply debate during the 2017 Budget. This program at Redhill MRT is a pilot and serves as a test bed for new assistive technologies such as navigation apps, aids and mobility assistance. 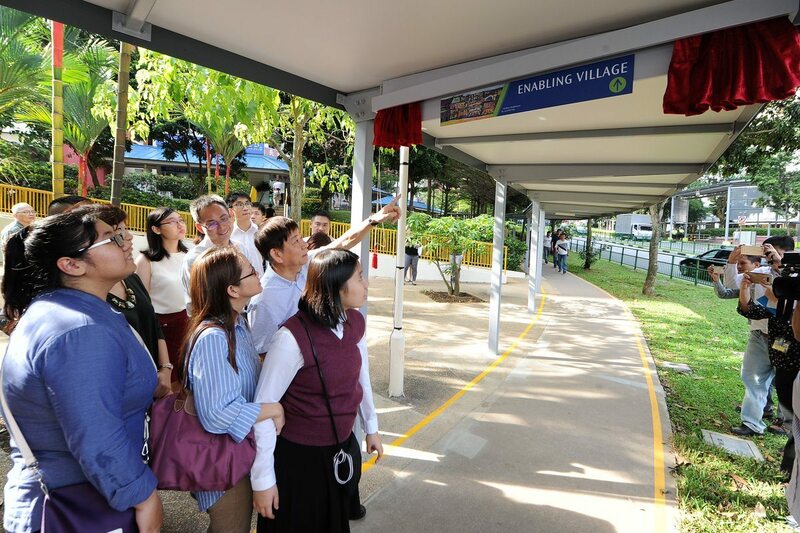 Minister for Transport, Mr Khaw Boon Wan toured the route to the Enabling Village from the train station this morning with beneficiaries and student artists from The Art Faculty, where he unveiled the special signage and added the finishing touches to the edge markings.